Sign up to earn money online with lucrative Affiliate2Day’s affiliate offers. Simply choose your preferable type of affiliate program, create your account, determine your marketing strategy and watch your account balance grows as your referrals become our customers! The Pay Per Sale program is an absolutely beneficial and favorable affiliate scheme that allows you to earn 25% commission on every order that is placed by any of the clients referred by you! It’s important to know how our websites work to truly appreciate how effective the Pay Per Sale program can be. For our members to be able to access communication tools for speaking with ladies they meet on our websites, they must purchase credits*. The more often your clients purchase credits, and in more expensive packages, the higher the commission you can receive. You can earn up to $94.75 US on any single client order. This means that if the clients you referred continue using our websites in the future, you will continue earning practically lifetime commissions from each and every purchase they make! *Credit is an estimated unit of payment the clients spend on using on-line and off-line services of the sites, such as Letter Correspondence, Live Chat services, Virtual Gifts, and some other. **You may also occur to earn the commission of $0.74 US in case your client gets the site’s special offer to purchase his first package of 20 credits at promotional price $2.96 US. We're adding even more benefits for you to enjoy when signing up to become our affiliate partner! Enjoy your welcome bonus of $25.00 USD for signing up the Pay Per Sale program. We’ll add the bonus to your affiliate account balance upon registration, and it will be available for cashing out with your first eligible payout. Commission Type: Pay Per Sale, 25% of every order placed by your clients. Welcome Bonus: $25.00 US for signing up PPS program. Payout Requirements: $50.00 US - minimum balance required for payout. The Pay Per First Order program is a superb and unmistakable choice for those affiliates who want to earn utterly high and limitless commissions! You may earn $150 US, $200 US or $250 US for each First Order. 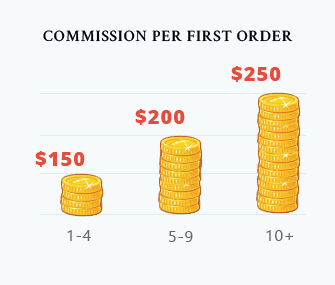 The total amount of money you earn varies depending on the total number of First Orders that customers referred by you make on any of our websites within a calendar month. • For 1-4 First Orders in a calendar month you will get $150 US per each First Order. In total, this allows you to earn from $150 US to $600 US per month. • For 5-9 First Orders in a calendar month you will get $200 US per each First Order. In total, this allows you to earn from $1000 US to $1800 US per month. • For 10 or more First Orders in a calendar month you will get $250 US per each First Order. In total, this allows you to earn $2500 US+ per month. There are no upper limits as the amount you earn solely depends on the number of clients with First Orders that you referred. Commission Type: Pay Per First Order, up to $250 US for each first order made by clients referred by you. The Pay Per Lead program is a fantastic way for affiliates who struggle to generate large volumes of referral traffic and to earn unlimited commissions with us! It is also the fastest and most popular way for our affiliates to boost their monthly profit. By joining the PPL program, you will get $6 US, $7 US or $8 US, depending on geography, for each unique registration on any of our sites by the customers that you have referred to us. We set no limits on the amount of leads you can drive per month, therefore your earning potential is unlimited. Please note that the quality of your traffic will be estimated by the conversion ratio of your leads to sales, which should not slip below 2% per month. Therefore, to qualify for a payout an affiliate needs to reach 2% of sales conversion. In other words, every 50 leads should be supported by at least one client’s purchase. Commission Type: Pay Per Lead, up to $8.00 US for every targeted lead/registration. Required Conversion Ratio: 2% min. Note: Please fill in your email carefully. Once your application has been sent for review or has been approved, you won’t be able to change it by yourself. We will send you a check/money order in the mail.We will send you a PayPal payment.We will send you a wire transfer.